You’ve booked a luxury cruise from Port Canaveral cruise terminal, but there are a few things to organize before you set sail. You might want to extend your cruise vacation from Port Canaveral by spending a night or two in a hotel near beautiful Cocoa Beach before or after your cruise. Disclaimer: This post does include affiliate links which we could earn a commission from if any purchases are made. Whether you are arriving by road or air, booking a hotel near Port Canaveral cruise terminal is a smart move, and can actually save you money. By arriving in Florida well before your cruise departs means that you won’t miss your cruise if you encounter problems or delays with flights, traffic or wintry weather. Even if your travel plans are thrown into chaos, you can stay calm and relaxed, knowing you have a couple days in hand before your cruise ships sails. Peace of mind is definitely worth paying for! Another benefit of booking a hotel near Port Canaveral is the shuttle service to the cruise terminal. Most hotels offer free or cheap cruise shuttle transport to Port Canaveral cruise terminal. If you also need cruise parking, you can save money by booking a Port Canaveral Cruise, Park and Stay package. It includes secure parking for the duration of your cruise and a hotel shuttle bus to the port – saving money on cruise parking and taxis. Check out our Guide to Port Canaveral Cruise Parking here! Here’s our comprehensive list of top hotels in the Port Canaveral area with cruise shuttle service to the port. We’ve done the hard work for you, rounding up all the options for the best hotels in Port Canaveral with cruise shuttle service. Just browse below and pick the hotel that best suits your needs. Please note that prices vary depending on the date and length of stay. The following prices are for comparison only. Quality Inn KSC puts you close to the beach, the Space Center and St Johns Wildlife Refuge. Air-conditioned rooms have the latest technology including Wi-Fi, LCD TV, refrigerator and microwave. Package includes free cruise parking and shuttle transfer to Port Canaveral cruise terminal. Minutes from local attractions and 15 minutes from Port Canaveral cruise terminal, Days Inn Cocoa is a popular choice for cruisers. Rooms are simple but comfortable and include Wi-Fi and a free breakfast. There’s also an outdoor pool and volleyball court. Free shuttle to and from cruise port. Located south of Cocoa Beach and 7 miles from the port, the newly renovated La Quinta Inn provides a night’s stay for two with free breakfast, complimentary parking and shuttle transport to and from the cruise port at Port Canaveral. Ocean Landings Cocoa Beach is a beautiful resort and racquet club with tennis courts and activity center. Just 5.89 miles from Port Canaveral with cruise shuttle available when you book a Cruise and Stay package. International Palms Cocoa Beach offers competitive pricing and a price match if you find a better rate. Right on the oceanfront, the hotel has 502 rooms, a pirate-themed pool and rescue gators in the lobby! Free parking and cruise transportation included in the package and discounts on food and beverages. Just 2.5 miles from the cruise terminals at Port Canaveral, this Radisson hotel offers a parking package that includes shuttle transport to and from the cruise port. You can even catch a glimpse of ships cruising in and out of Port Canaveral from some rooms! Just off I-95 Exit 215, the Ramada Inn Titusville is a top choice for those driving to Florida and requiring cruise parking and shuttle as part of a Park and Cruise package. Relax by the pool or visit the nearby attractions such as the Kennedy Space Center before or after your cruise from Port Canaveral. Minutes from the beach, Quality Inn and Suites Cocoa is a great choice for families pre and post cruise. Suites include a kitchenette with microwave, fridge etc. There a pool, spa, fitness center, laundry and volleyball court onsite. Free cruise shuttle transfers you smoothly to and from Port Canaveral cruise terminal. Book a night or two at Best Western Cocoa Beach on a Fly, Snooze and Cruise package and get free pickup and drop-off from Orlando Airport and a free shuttle for 2 to the cruise port. Additional passengers are charged $14 return. Located on N. Atlantic Ave, Holiday Inn and Suites Cocoa Beach has comfortable rooms, cable TV and pool. It also offers an amazing complimentary breakfast buffet. Package includes room, parking and shuttle to Port Canaveral cruise terminal. Conveniently located for those driving to Port Canaveral, Budget Inn Cocoa Beach is on I-95 and SR-520, Exit 201. With pool, free Wi-Fi and free coffee in the lobby, it offers great value for money. Shuttle available to the cruise port, just 15 minutes away. America’s Best Value Inn is 8.5 miles from Port Canaveral and offers rock bottom prices with free parking for up to 2 weeks. Packages include breakfast, outdoor pool, Wi-Fi and shuttle transport is $5 per person round-trip. Rooms have cable TV, mini fridge and microwave. Close to the Kennedy Space Center, St Johns National Wildlife Refuge and beaches, Best Western Titusville has a fitness room and outdoor pool for guests. Enjoy a free breakfast before the shuttle transfer to Cape Canaveral cruise terminal. Start your cruise in style with a stay at the beautiful Hilton Oceanfront at Cocoa Beach. This well-located hotel is right on the beach. Cruise and Park packages include one night’s stay, car parking and a shuttle to and from Port Canaveral cruise terminal. Just 15 minutes away. Luxury accommodation just 2.5 miles from Port Canaveral, free parking and shuttle transport to and from the cruise terminal can be found at the Radisson Resort at the Port. They also offer shuttle transport to and from Orlando Airport for those arriving by air from $33 per person one way. Six miles from the port and right in the heart of the action on Cocoa Beach, this upscale Four Points by Sheraton hotel is within walking distance of the beach, restaurants and the iconic Ron Jon Surf Shop. Packages cost around $30 more than regular rates and include parking and shuttle to the cruise port. Holiday Inn Titusville is well located for exploring the Space Coast attraction and Cocoa Beach before or after your Port Canaveral Cruise. Shuttle transport is included in the Snooze Park Cruise package along with free onsite parking. Shops and restaurants are close by and the cruise terminal is about a 30-minute drive away. 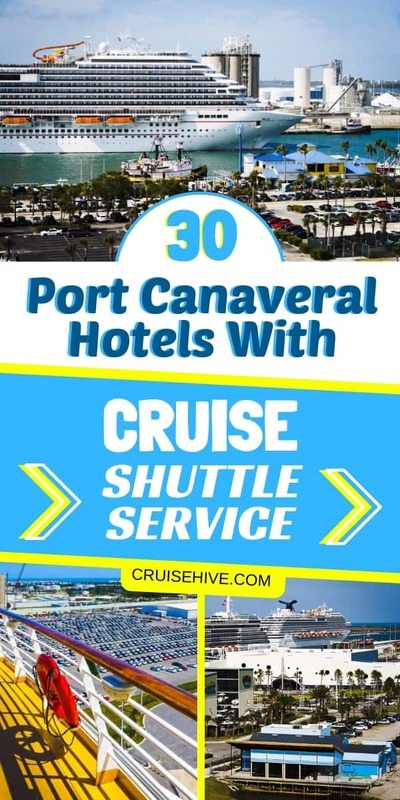 Free shuttle to and from Port Canaveral cruises, free parking for the duration of your cruise, and a luxury suite with king bed, sofa bed and living area. That’s what you get at this Courtyard by Marriott package and breakfast is included. For those who want the ultimate Snooze, Park and Cruise package, book into the 5* Cape Crossing Resort and Marina on Merritt Island. Accommodation is in a private luxury townhouse with waterfront views. Ideal for families or groups of cruisers, the package includes parking for up to 2 vehicles at a private parking lot just 17 minutes from Cape Crossing Resort. Shuttle transport to Port Canaveral is included from the car lot to the port and takes about 10 minutes. Save money by booking a hotel in Orlando that includes transfers to and from Port Canaveral cruise terminal. If you’re driving to Orlando, book a hotel that offers complimentary cruise parking and shuttle transport to Port Canaveral. It allows you to spend a few days enjoying the Orlando theme parks and shopping malls before embarking on your cruise! Snooze Park Cruise packages at the Clarion Orlando Airport combine the excitement of Orlando attractions with convenient and cost-effective cruise parking and shuttle to Port Canaveral cruise terminal. Stay the night and enjoy a free breakfast before driving to the parking lot near Port Canaveral. Take the shuttle bus from there to the port. It’s very affordable and easy. Snooze, Park and Cruise packages at Fairfield Inn Orlando Airport have excellent reviews by past cruisers. Package price includes one night’s accommodation, breakfast and cruise parking with shuttle just 10 minutes from Port Canaveral cruise terminal. Do all your sightseeing form this well-located Courtyard Marriott Orlando Airport Gateway Village hotel before or after your Port Canaveral cruise. After a relaxing night’s sleep, drive to the parking lot near Port Canaveral where your car will be securely parked free during your cruise. The package includes shuttle transport between the Port Canaveral cruise port and the parking lot. Bon voyage! Book early to get a Cruise and Park package at Hyatt Place Orlando as it books up fast! The package includes a night in a beautiful room, use of the pool and an onsite restaurant. Those flying into the airport get free shuttle transport to Port Canaveral. Those with a car should drive to the car park at Port Canaveral for free car parking and shuttle to and from the cruise port. Enjoy a luxury stay at the Homewood Suites Orlando before or after your cruise from Port Canaveral. Cruise shuttle transport and parking just 10 minutes from the port are included in the package price along with breakfast. Enjoy a king-size room at the Hampton Inn Orlando Gateway Village hotel as part of a Snooze, Park and Cruise package from Port Canaveral. Cruise passengers stay the night in a luxury room with breakfast and Wi-Fi. Drive to the secure parking lot near Port Canaveral for free cruise parking and get the free shuttle to and from the cruise ship. Enjoy the comforts of the Holiday Inn Orlando for one night as part of this all-inclusive cruise package. Drive yourself to the parking lot near Port Canaveral where your car will be securely parked for the duration of the cruise. Price includes shuttle between the parking lot and the cruise port. Centrally located close to Orlando Airport, Hampton Inn Orlando offers Park and Cruise packages with a choice of queen or king guest room. Those arriving by car will drive to the cruise parking lot on the day of the cruise departure. It is just 10 minutes from Port Canaveral cruise terminal. From there, a free shuttle takes you to and from the cruise port. The luxury Embassy Suites Orlando Airport is well located for cruisers flying into Orlando Airport. Overnight accommodation and shuttle transfer to the cruise is included. Drivers can also park their car free for the duration of their cruise from Port Canaveral. The hotel has a car park just 10 minutes from Port Canaveral cruise terminal where you can drop your vehicle and take the shuttle to the port. Once you’ve booked your Port Canaveral hotel with cruise shuttle, check out more things to do in Port Canaveral during your pre-cruise stay! If you’re staying in Cocoa Beach before or after your cruise, you’ll find more attractions nearby in this fact-packed ebook of Days Out Around Cocoa Beach.